At a wedding recently I was pleasantly surprised to see giant Jenga and other oversized games scattered around the lawn. While we waited for the newly-weds to finish their photographs and other formalities we played chess, pick up sticks and the little ones played with the giant inflatable bowling set. I think I might have even seen an oversized pig get tossed. It would seem as the world and its pressures move forward at an alarming pace, families are returning to old-fashioned values and looking for ways to get more out of the time spent together and this includes playing good old yard games, like giant Jenga, chess, dominoes, 4-to-score, plus a whole lot more. Now with holidays just around the corner it’s the perfect time to stock up on a few to keep everyone entertained. Getting physical is obviously good for everyone and other benefits of ‘just playing’ include children learning how to get along, maybe a lesson for a few adults too, developing fine and gross motor skills and hand-eye coordination. Top Giant Games for Full On Fun! Jenga is to the world of games what peanut butter and jelly is to the gourmet world—an absolute classic. Now it’s available as a giant game or rather, a giant sport that stacks to 4 feet and then some. Whether you’re playing it outdoors at a picnic, wedding or casual get-together everyone will want to get in on the action of giant Jenga. Of course you can also play indoors should the weather spoil your plans. Uno, another classic card game has been super-sized and is now even more fun. The cards are big, or as one of my dear friends put it, “holy frijoles, the cards are huge!” They’re also made of a hard cardboard, which means they can handle quite a bit of wear and tear. 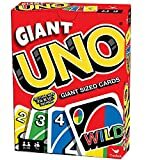 Giant Uno, like its smaller cousin, is fun for everyone from 3 years old all the way to 103. Weather and fade resistant, this giant version of 4-to-score can be played outdoors or inside. It’s perfect for birthday parties, holiday clubs, family get-togethers, after-school programs and even in the classroom. In order to match four colored rings in a row young players learn and develop teamwork and cooperation skills. The popular game also encourages strategic thinking, as well as cause and effect. While it’s perfect for two players, it can also be played in teams, like kids vs grown-ups, or girls vs boys. Normally known as beer pong, there’s a new giant sized ‘cup’ in town and it’s not necessarily a drinking game. Titan Pong is the jumbo sized version using giant cups and ping pong balls—it’s perfect for outdoor and indoor fun. There are 12 giant buckets and 3 balls and if you have younger players around you can put own spin on the game to include them. Best for Ages: All ages! 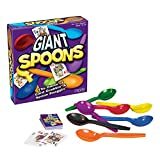 Giant Spoons is all about grabbing cards and snatching spoons. The idea is to get four cards of a kind and then rush to grab a spoon. The player left empty-handed is out of the game, or if a player doesn’t hold on to their spoon tight enough! This classic game is suitable for 3-8 players and the manufacturer’s recommended age is 7+ however younger kiddies can participate too. The giant bowling set is fun for everyone. Little hands like that it’s so easy to set up, and because the ball and pins are big and hard to miss, they’ll actually get a few strikes in. For adults it’s a great way to relax and just spend some quality time with friends and family. The durable PVC allows the set to be used indoors or outside and will last a long time. The giant version of chess is a great way to get people interested in the game. It’s perfect for any public areas and a fun way to introduce ‘the game of kings’ to younger players at schools, holiday clubs and play areas. The giant chess set brings the game to life and is a real crowd-pleaser. Definitely worth adding to your collection over the holidays. The giant set of dominoes takes fun to a whole new level. Using sustainable sources, the 28 pieces are handcrafted, painted black with white pips. The wooden dominoes’ edges are wide enough to stand and stack or build a giant dominoes line. The bag is included, which means you can take your giant dominoes on holiday, camping trips, day trips or anywhere there’s going to be a group of people. Perfect for the Peppa Pig fans, Giant Snakes & Ladders is an 80x80cm floor game that’ll keep little ones entertained for hours, along with mom and dad, grandparents or minders. The game is exactly the same as the traditional Snakes & Ladders except it features all the wonderful characters from the popular TV show. Have you discovered any traditional games in giant form that were a massive hit with players? Let us know in the comments below. Feature image courtesy of Flickr, rolle@bassfire.